Much has been written about academic medicine and its ailments. The International Campaign to Revitalise Academic Medicine (ICRAM) immediately recognised the importance of an evidence based approach to the ongoing discussion about academic medicine.1 A task group was developed to systematically collate and evaluate the available evidence. We initially targeted major themes that were readily identifiable as being important and for which data would be reasonably straightforward to collect. The type of evidence (box 1) differed for each research question. Here we present a summary and future research agenda. The Oxford English Reference Dictionary defines academe as “the world of learning,” and academic as “scholarly: to do with learning.” Scholarship is encountered as a key principle of academic medicine,w1 and it entails the discovery, integration, and application of knowledge, and teaching.w2 Academic medicine practitioners are expected to demonstrate systematic and sustained scholarly effort, with recognisable outputs valued by peers. Many doctors teach (for example, over 40% of UK general practitioners host medical trainees2) or participate in research sporadically, and the role of such practitioners in the academic enterprise requires more study. Patients are also increasingly involved in clinical research,3 education,4 and service5 and are important academic allies. Finally, scholarship in fields related to health care and medicine is often pursued by non-physicians (nurses or laboratory scientists, for example) who may also encounter the “triple jeopardy” of trying to excel simultaneously in teaching, research, and clinical practice.6 However, policies addressing academic medicine careers typically do not expand the definition to include these scholars.7 Differing (or even conflicting) professional perspectives may prohibit recognition of common issues and lead to different groups fighting over available funds.8 Moreover, social and public health responsibilities and priorities of academic medicine may be different in affluent societies and in those with poor health systems. Situation analyses are useful to identify barriers, failures, and successful applications in different settings. Most literature to date has selectively focused on developed Western countries, a minority in the global scale. We conducted an illustrative situation analysis for China (available from corresponding author). China has 2.2 million doctors, a third of the world's total number. Problems include the need for an increased academic workforce and structures to support continuing medical education and the production of high quality, licensed doctors; disproportionately low funding for clinical science research; the poor visibility of most domestic research; and an uncertain role for academic medicine in the changing finances of the Chinese health system. Academic medicine is struggling to keep pace with educational demands or “capacity.”9 10 For example, in the United Kingdom 10-20% of posts designated for medical professors and senior lecturers were recently noted to be vacant.10 Much research has explored requirements for doctors,w3-w5 but little is known about capacity requirements in academic medicine.11 Often, predictions are based on past trends, but evolving factors should also be considered. Population demographics are changing in many countries, with an increasing proportion of elderly people and a decreasing birth rate. Service expectations, societal preferences, and health needs evolve. Models of healthcare delivery may affect training programmes and resource allocation. Furthermore, demographics of academic physicians change. Many departments are faced with ageing faculties—for example, a quarter of faculty members in the department of medicine of the University of Toronto will be over 65 by 2011.12 Gender inequalities are also prominent. In the United States, women comprise almost half of medical students (45%) and instructors (46%) but only 11% of full professors.13 w5 This inequality is worse in other countries.14 Academic career paths are notoriously individualistic and variable, posing additional challenges to model workforce requirements.15 Finally, changing research priorities such as the need to translate basic research to clinical applications16 may also affect these requirements. Medical research is disproportionately dominated by a few wealthy countries. There is a strong correlation between the number of papers indexed by the Institute for Scientific Information (ISI)18 and the gross domestic product,w11 and between the number of citations and GDP (fig 1). 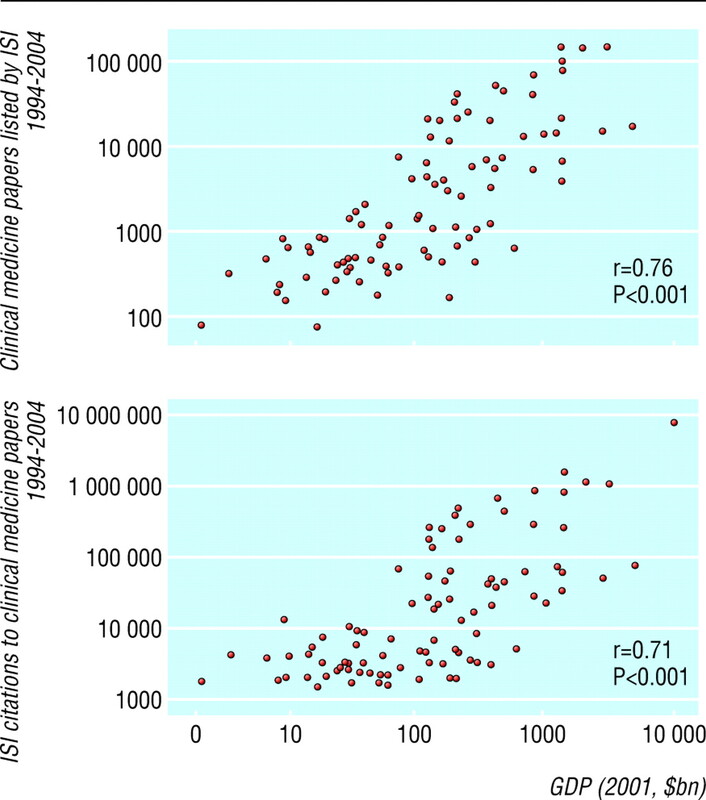 No country with an adjusted GDP under $70bn received more than 15 000 citations to clinical medicine papers in the past decade (less than a thousandth of the total number of citations). The same picture applies in related life sciences (data available from contributing author). These indicators are objective, but provide a partial picture. Lack of research infrastructure and funding, publication bias, lack of recognition for some applied research disciplines, and poor access to information in the developing world must be considered. Much research outside Western countries appears in domestic journals available only locally. For the top 10 academic hospitals in China, 18 articles appear in domestic journals for every one in a journal indexed by ISI. Although most burden of disease is carried by developing countries, clinical research is done where the money is, not where the investigation should be done.w12 An estimated 94% of the high impact scientific potential of humankind is lost because of various global inequities and squandered opportunities.w13 w14 Brain drain further diminishes the academic potential of poor countries. Brain drain consists of both external migration and internal migration of academics to organisations that fail public health priorities in host countries. Furthermore, doctors have a shrinking presence in the broader life sciences. 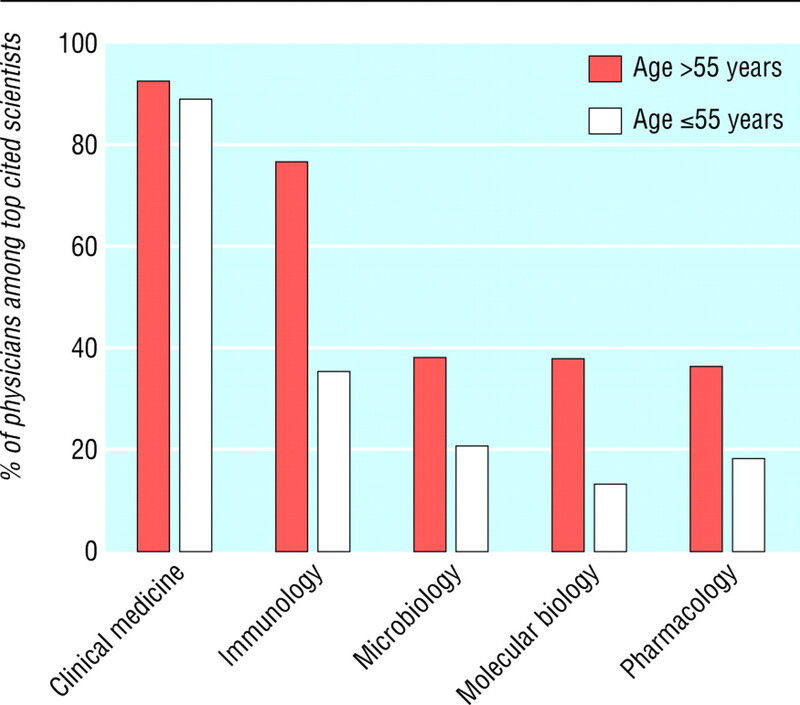 Analysis of the most cited scientists in the past two decades in life sciences shows that the representation of doctors among those who are currently 55 or younger has decreased sharply compared with older generations.w15 They still represent approximately 90% of most cited scientists in clinical medicine, the last domain where their research influence remains strong (fig 2). The pharmaceutical, medical device, and biotechnology industries have an increasing impact on academic medicine and its products. Twenty six of the 100 most cited clinical medicine papers in the past decade have included authors with industry affiliations (see table A on bmj.com). A similar proportion is seen in most life sciences except for social sciences and psychology/psychiatry.18 All of the 14 most cited randomised trials received support from industry, usually with no support from any other source, and eight included industry authors (see table B on bmj.com). The most influential clinical research is not conducted under the auspices of the public sector. Moreover, industry sponsored studies are often disproportionately publicised by the media. Problems: what are the problems with academic medicine across different settings and countries? Capacity: what factors influence career choice and academic medicine capacity? Indicators: what are reliable indicators of quality, impact and outcomes in academic medicine research, teaching and service? Funders: what are the relations between academic medicine and its funders, in particular the pharmaceutical industry, and how should they be optimally regulated? Patients: does academic medicine work for patients? Two systematic reviews have found that studies funded by industry report findings favourable to sponsors more often than non-industry funded studies (odds ratio 3.6 (95% confidence interval 2.6 to 4.9) and 4.1 (3.0 to 5.5)), but the quality of industry funded studies was comparable to non-industry studies.w16 w17 Industry funded investigations used inactive controls (placebo or no treatment) more frequently, increasing the likelihood of “positive” results. Prioritisation and impact of clinical research is dictated primarily by commercial interests. Academic medicine (and indeed the public) has lost control of the research agenda. Furthermore, this grave situation pertains to developed countries with mostly well regulated environments. The relation between industry and academics in developing countries is probably far worse, and inadequately regulated. Does academic medicine eventually benefit or harm patients? There also seems to be a need to examine whether patients' outcomes are improved by academic medicine. Subjective outcomes (satisfaction, preferences, perceptions, and roles) as well as objective outcomes (disease) are important. Preliminary searches indicate that most evidence is non-randomised, and confounding is a major problem. The available evidence pertains to diverse conditions, such as general care, acute and chronic critical care, surgery, and obstetrics,19–23 but most data again seem to come from developed countries. What is the evidence that academic medicine benefits patients? Is there evidence that academic medicine may harm patients? Could all health care be done in non-academic clinical settings? Is academic medicine useful for patient outcomes globally, under select circumstances, for specific healthcare problems, in specific countries, or never? Academic medicine needs evidence to guide its future direction.24 This preliminary analysis has identified areas where further systematic efforts are indicated (box 2) and we welcome independent researchers to join us. Contributors All members of the working party (see bmj.com) contributed to the conception and content of the paper, contributed to drafting, and approved the final version for submission. John P A Ioannidis is guarantor.
. ICRAM (the International Campaign to Revitalise Academic Medicine): agenda setting. BMJ 2004;329: 787–9.
. Special non-clinical interests-GPs in education, research, and management Br J Gen Pract 2003;53: 438–40.
. Consumer involvement in health research: a review and research agenda. Health Policy 2002;61: 213–36.
. Patient oriented learning: a review of the role of the patient in the education of medical students. Med Educ 2000;34: 851–7.
. Involving patients and the public in healthcare: a discussion document London: DoH, 2001. Researcher, clinician, or teacher? [editorial] Lancet 2001;357: 1543.
. Implementing the clinician scientist scheme. TAMS: London, 2002.
. The relation between funding by the National Institutes of Health and the burden of disease. N Engl J Med 1999;340: 1881–7.
. Academic health leadership: looking to the future. Clin Invest Med 2003;26: 315–26.
. A survey of clinical academic staffing levels in UK medical and dental schools. London: CHMS, 2001. www.chms.ac.uk/chms.pdf (accessed 14 Sep 2004).
. A profile of academic physicians in British Columbia. Acad Med 1989;64: 524–32.
. Enhancing faculty renewal and development to address the shortage of physician supply. Medinews 2001;13: 1–5.
. Status of women in small academic medical communities: case study of the Zagreb University School of Medicine. Croat Med J 2003;44: 32–5.
. Professors not professing. JAMA 2004;292: 1060–1.
. Compensation and advancement of women in academic medicine: is there equity? Ann Intern Med 2004;141: 205–12.
. Materializing research promises: opportunities, priorities and conflicts in translational medicine. J Transl Med 2004;2: 5.
. Understanding the careers of physician educators in family medicine. Acad Med 2001;76: 259–65.
. Web of knowledge: essential science indicators. http://www.isinet.com/ (accessed 6 July 2004).
. Case mix, costs, and outcomes. Differences between faculty and community services in a university hospital. N Engl J Med 1984;310: 1231–7.
. Care of patients with upper gastrointestinal hemorrhage in academic medical centers: a community-based comparison. Gastroenterology 1996;111: 385–90.
. Outcomes and resource utilization for patients with prolonged critical illness managed by university-based or community-based subspecialists. Am J Respir Crit Care Med 1998;158: 1410–5.
. Hospital teaching status and outcomes of complex surgical procedures in the United States. Arch Surg 2004;139: 137–41.
. Effect of academic affiliation and obstetric volume on clinical outcome and cost of childbirth. Obstet Gynecol 2001;97: 567–76.
. Academic approach to academic medicine. Croat Med J 2004;45: 245–7.